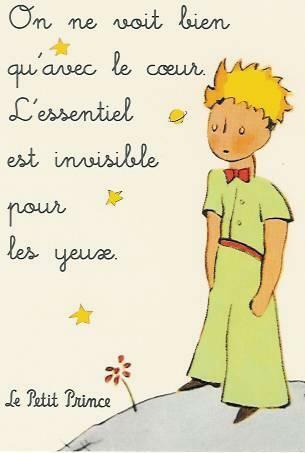 French writer, poet, and pioneering aviator, Antoine de Saint-Exupéry, is popping up all over the place in my life right now. Recently I read The Little Prince (again) and loved the sweet, sad, and hopeful story. The author’s humble illustrations also remind me that when you draw from the heart, your images are true, and can last the test of time. Just now, while ordering gifts online, this quote in a literary catalog, jumped out. I remember some of my past experiences when that statement was spot-on, accurate, and true. I think Santa just gave me my Christmas gift to last the whole year through. Creativity and wellness message for today: Allow your heart to show you where to find peace. This entry was posted in Art, Books, Human Nature, Psychology and tagged Antoine de Saint-Exupéry, finding serenity, peace, serenity, The Little Prince by adairheitmann. Bookmark the permalink. This is just what my first-born needed to hear today Many thanks for being the pebble, Adair! My website is about educational toys for toddlers.